I got a bad strain/minor tear(not sure what to call it) in my pec a few years ago during a chest workout, i took it easy for a while while doing really light training and some massage, but recovery was really slow and i reinjured it again(probarbly went abit too heavy too fast, even if i wasnt using alot of weight compared to before the injury), so i found this site and contacted you. I did the ice massage treatment several times a day for a few weeks followed by lighther training while increasing the resistance very slowly over a longer period of time and it felt like i had recovered, even if i still had some discomfort around the area during some activities and when using the body in certain angles. I was doing the ice massage and some normal deep tissue massage every now and then along with the lighter training as well. I could start lifting heavier weights again with no real problem, i was still increasing the weight really slowly and only doing higher reps (no lower than 8 reps and very rarely going to failure), and i thought that i had made a full recovery. After a year or so of everything feeling fine and training without much issue i hurt my pec again while training chest (this is about 4 weeks ago now),even if it wasnt as bad as the first time i still felt it and it still hurts. I had warmed up very thoroughly and i wasnt really using that heavy weights(i´ve allways been really mindful of warming up thoroughly, even before the first injury, atleast 6-7 sets before doing any heavier lifting) and now it feels like im back to square one again after all that work and recovery time. After this most recent reinjury i started icing immediately and for several times a day the following week, i backed off all training for a week and then slowly started training lighter again ( extremely light chest training, most other muscles i could train normally, even if i felt some discomfort in my chest, i did go ligther on those parts aswell for a week or two). How should i handle the rehab this time so i can make a full recovery? I should say that i´ve always had a good diet plan with high protein, fiber and good fat sources along with extra supplementation of magnesium and vitamins(even for years before the first injury). Forgive any grammar errors, English isn't my native language. Your English is fine, no worries. It's 100% better than my Spanish (I'm in Uruguay at the moment). 1. 'Good diet plan' is relative. Though I'm guessing it's definitely better than most since you actually said 'protein' and 'good fat'. 2. How much magnesium? What kind? 3. What's your vitamin D level? 4. Do you think you originally had an actual rip/tear? 5. Originally when it got better, how much better was it before you went back to lifting? 6. When you ice massaged it previously, how did you do that, exactly? 7. Are you a serious lifter, a casual lifter, or? Weights only, or also other athletic activities? 8. You're right handed, yes? It's important to understand that you've had an ongoing Process of Inflammation. See the role that that plays in the Pain Causing Dynamic. One can have a Tendonitis issue most anywhere in the body. In the chest/shoulder area the same tendonitis dynamic applies. The tendonitis dynamic leads to rip/tear injury, and, one can have debilitating pain with no rip/tear at all. Various factors are involved, and the more you reverse each factor, the less pain you have and the closer you get to 'back to normal'. Thanks for the reply Joshua, i´ll try to answer the questions the best i can. 4. I really dont know, but i doubt it was a real tear, if so it was a real minor one, i didnt get any visible deformity, it felt like someone pinched my chest when the injury occured and i could even do another set with the same weight afterward (47kg dumbbells) i doubt i could do that if it was a real tear? 5. i was lifting almost all the time during rehab, just really light weights. WHen i started training "normally" again for chest i could start increasing the weights to the point where it gave me a decent workout and offered some resistance and effort, and i still didnt feel any pain during/after the workout, only time i felt any pain were in everyday life and sometimes during work when i did something in some angles, worst was the movement similar to the flye exercise or a crab closing its claws (i hope this makes sense lol), but during most movements, like dumbbell presses and such i didnt feel any pain. 7. I would say im quite serious of a lifter, it might not look like it it in that pic due to pecs being my weakest muscle (due to these injuries) but i´ve been working out with weights pretty regularly for several years. I´ve been doing some martial arts when i was a bit younger and some cycling, but it´s been a few years since i´ve done any real cardiovascular work due to a bad knee that refuses to heal (but that is a different topic, i might start another thread on that). I´ve read those links you posted but i will read them again a few more times. Good job on the magnesium! I'd do 120ug of Vit D3. 50ug is 2,000i.u. 's, vitamin researchers reccomend 5,000i.u. 's as a daily maintenance dose (though you can take a weeks worth or a month's worth at once). Curious what your Vit D level is. So probably you need to fine tune the supplement nutrition a little bit (magnesium requirs B6, for instance), but primarily you probably need to more thoroughly work the chest structures. Something in there is still too tight and ultimately that's causing problems. Either that's some scar tissue (when tears heal, and/or when scar tissue forms it 'pulls' itself together), or some lines of muscle are stuck too tight pulling on something it shouldn't be, or realistically, some amount of both. Have you worked the OTHER side of the chest? If somebody put an elbow in various spots on your back/rear shoulder, I wonder what they'd find. Probably the cause/source of the pain is on the front (chest and/or shoulder) but there could very well be something at play on the back side too. 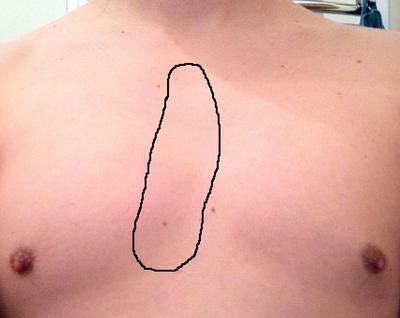 Question: Can you pinpoint a spot of pain, or is that area you circled a 'generally' painful area though you can't find anything specific in that area? Got you on the supplementing, i´ll do some adjustments. By work the other side of the chest do you mean massage it or train it? when training i have always done the same for both sides, same when massaging, i´ve been working the entire chest even if i´ve focused a bit more attention to the middle. By 'other side' I mean right side as opposed to left side, and vice versa (as relevant to your situation). It never hurts to strength the back side, of course. 1. Get more specific with the massage. Find any dense/tight spots and try to make the soft/loose. It's certain you have some of that going on. It could even be connective tissue (where it gets dense close to the bone/cartilage, deep towards the ribs and/or sternum. 2. Lay on the floor. Put something really heavy on your chest/sternum, and take 20 deep inhalations (to expand the ribcage and attached tissue). Maybe do several sets of that. Do that daily for a week, and if it feels helpful, continue for another week or two. If not, then it may/may not be worth it. This will help with a variety of little things in there, and who knows, maybe a rib is just a little bit out of joint there against the sternum. This will help mobilize all the moving (and non-moving) parts in there. Thanks for the suggestions and advice, i will try it out. About the massage, how long for each massage session? and how many times a day? and for how many days/weeks? When you say a really heavy weight to put on my chest, do you mean like 20kgs 40kgs? And how should i do my weight training for chest? just keep doing lighter weights with medium/higher reps and increase slowly? or do you recommend any specific exercises? also how heavy do i dare to go, and when do i dare to increase the weights? I know thats alot of questions, but i really want to do it right this time. 1. I would keep lifting, just keep it under the level of irritating the already irritated dynamic. How you do it doesn't matter as long as it doesn't make things worse. As the structure gets better, you'll be able to do more and more. What's most important is that you are creating change where change needs to happen. YOu can massage all day long but if you're not targeting very effective, or causing the tissue to change, then the amount of duration/repetition is irrelevant. 3. As much weight as you can happily bear. Have someone sit on your chest and do it. Imagine if you could put your ribcage in a vise, and then try to expand it. Certain parts won't move, others that usually don't will. Don't hurt yourself obviously, and you aren't likely going to find an actual vise, but it's the same mentality. Go heavy as you can, but don't hurt yourself. Start with a 20, then move up to a 30 or 40, etc. Slow deep inhalations to expand the ribcage, exhale/deflate as much as possible. Now it´s pretty clear on how i should proceed with this, thanks for clearing things up. I´ll post some updates as the rehab goes along. Definitely do keep us updated! It's a process. 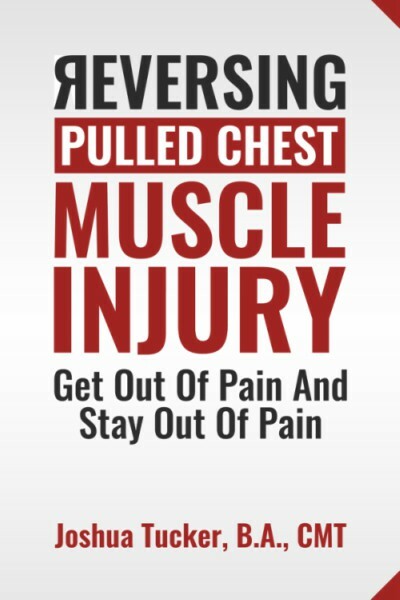 I, too, have recurring pectoral injury, but it is more in the belly of the muscle. I hurt it about 25 years ago, and it just keeps recurring, much like the other commenter's. It is frustrating. Half the time the recurrence is triggered by mundane things- opening a jar; golf, etc. I'm looking for some answers. Any suggestions? Part of the answer is found in 'the tear'. It's old, so it's 'healed'. But when there is actual tear, scar tissue fibers, the same fibers as everything else in there, lay down in all different directions, which is not as structurally sound. It takes just a couple of those tiny tiny fibers to break off, and the brain goes "oh no we're injured" and kicks in/continues the 'healing mechanism', which is more pain/inflammaiton/scar tissue formation. So one factor of fixing the problem is getting the tissue of/around the tear soft and gummy again, aka 'healthy', so it won't continually have microtear happening. There are other factors involved as well, all working together to keep the ecology of the area such that 'everything is fine until I do some little thing'. Everything isn't fine in there under the surface of the skin, even if there's no pain. Inflammation process, too tight muscle and connective tissue, nutritional insufficiency, remnants of injury (scar tissue build up), etc.